Turkey is a country with a landscape full of dramatic contrasts from the largely flat western side in Europe to the rugged, mountainous eastern side in Asia separated by the Bosphorus waterway. To cope with this challenging environment, the railways used simple but powerful steam locomotives and continued to do so until the late 1980s. Turkey was one of the last countries in the world to use steam traction and it became a mecca for steam enthusiasts. In Part 1, we visited the Asiatic side around Izmir and the Black Sea coast around Zonguldak before moving east to the Euphrates Gorge and then south to Konya. In this Part 2, we revisit the Zonguldak area and the Burdur system before returning to Izmir and then continue along the Konya and Afyon line. We visit several of the lines in the Afyon area before revisiting the Burdur system and return to Izmir from Denizli. Although the named express trains were usually diesel hauled, most of the country was steam worked using a variety of steam engines of many different types. Here we see both main line and secondary line, passenger, freight and mixed trains hauled by a mixture of 2-10-2s, 2-10-0s, 0-10-0s, 2-8-2s, 2-8-0s and 0-8-0s passing through some dramatic scenery and weather. There are double-headed and banked (even some double banked) trains. Prussian, German and USA built locomotives abound. We see some British Stanier 8F “Churchill” 2-8-0s working trains plus a brief glimpse of a steam crane on shunting duties!. 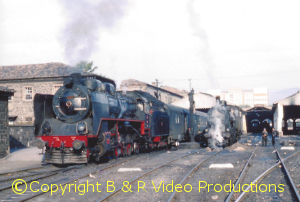 In addition to the main and secondary lines footage there are some steam shed scenes. There is even footage of a rail-across-rail level crossing! An absolutely fascinating record of the last years of steam traction in Turkey! Cover photo:- Cover photo:- Colin White. 57009 arrives at Basmane from Kars and leaves on the 11am to Soma, 13/12/75. Steam in Western Europe in normal service outlasted that on British Railways by some years. This video gives a flavour of what could be seen in use in six countries over the English Channel: FRANCE, SPAIN, PORTUGAL, ITALY, AUSTRIA and WEST GERMANY. The locomotives were different, being in a number of cases larger than British ones. Wheel arrangements were sometimes not what had been seen in Britain. Eight coupled varieties were also often common. The loading gauges were often more generous and on the Iberian Peninsula the track gauge was wider. Even so, the countries did use narrow gauge quite widely. Types of locomotive that Britain only experimented with could be seen, such as Franco-Crosti, Giesel-fitted and oil-fired engines. Some locomotives were British built and these could be seen working into the 1970’s for those enthusiasts who ventured abroad to see or film them. 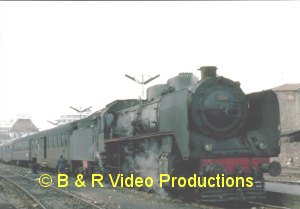 Many of these locomotives can be seen in this video, from the smaller narrow gauge types to Pacifics, Heavy Freight engines, Beyer-Garratts and twelve coupled tank engines. Often spectacular scenery was encountered and winters with snow guaranteed. Cover photo:- Colin White, 044 Class at Cochem, West Germany, September 1970 .